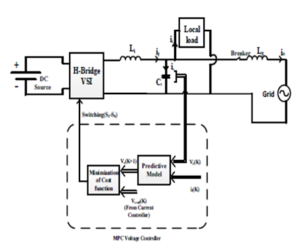 In this paper a nested power-current-voltage control scheme is introduced for control of single phase power inverter, integrating small-scale renewable energy based power generator in a microgrid for both stand-alone and grid-connected modes. 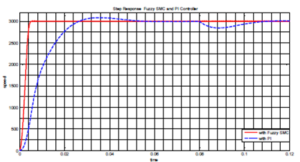 The interfacing power electronics converter raises various power quality issues such as current harmonics in injected grid current, fluctuations in voltage across the local loads, voltage harmonics in case of non-linear loads and low output power factor. 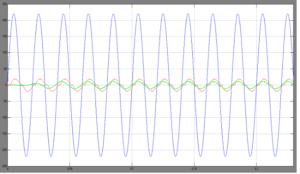 The proposed nested proportional resonant current and model predictive voltage controller aims to improve the quality of grid current and local load voltage waveforms in grid-tied mode simultaneously by achieving output power factor near to unity. 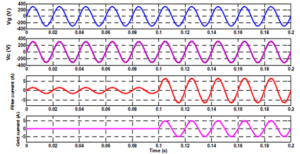 In stand-alone mode, it strives to enhance the quality of local load voltage waveform. The nested control strategy successfully accomplishes smooth transition from grid-tied to stand-alone mode and vice-versa without any change in the original control structure. 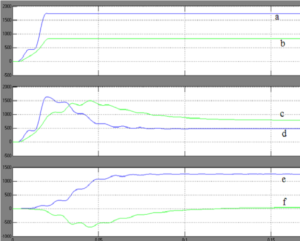 The performance of the controller is validated through simulation results. 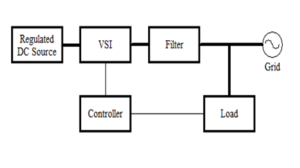 In this paper, a nested proportional resonant current and model predictive voltage controller is introduced for control of single phase VSI integrating a RES based plant in a microgrid. 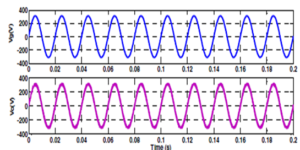 This strategy improves the quality of local load voltage and grid current waveforms with both linear and non linear loads. 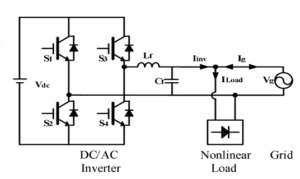 A non-linear load such as the diode bridge rectifier introduces voltage harmonics, but this scheme is successful in achieving low THD values for inverter local load voltage and grid current simultaneously. 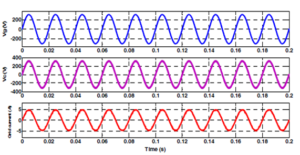 Simulation results validates the outstanding performance of the proposed controller in both steady state and transient state operations. 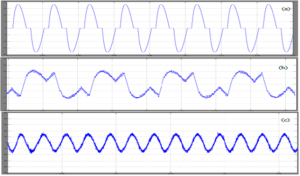 A smooth transfer of operation modes from stand-alone to grid-tied and vice versa is also achieved by the nested control scheme without changing the control algorithm. H. Farhangi, “The path of the smart grid,” IEEE Power and Energy Magazine, vol. 8, no. 1, pp. 18-28, Jan/Feb. 2010. F. Blaabjerg, Z. Chen, and S. B. Kjaer, “Power electronics as efficient interface in dispersed power generation systems,” IEEE Trans. Power Electron., vol. 19, no. 5, pp. 1184–1194, Sep. 2004. 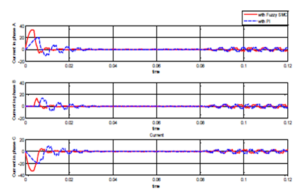 F. Blaabjerg, R. Teodorescu, M. Liserre, and A. V. Timbus, “Overview of control and grid synchronization for distributed power generation systems,” IEEE Trans. on Ind. Electron., vol. 53, no. 5, pp. 1398–1409, Oct. 2006. 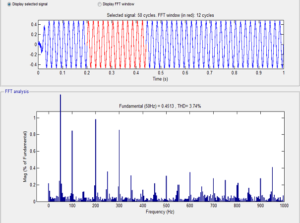 Q. C. Zhong and T. Hornik, “Cascaded Current–Voltage Control to Improve the Power Quality for a Grid-Connected Inverter With a Local Load,” IEEE Transactions on Ind. Electron., vol. 60, no. 4, pp. 1344- 1355, April 2013. 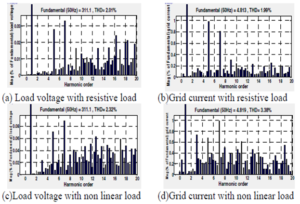 Y Zhilei, X Lan and Y Yangguang, “Seamless Transfer of Single-Phase Grid-Interactive Inverters Between Grid-Connected and Stand-Alone Modes,” IEEE Transactions on Power Electronics, vol. 25, no. 6, pp. 1597-1603, June 2010.